If there is one thing I’ve learned from my visits to the Southeastern states throughout the years, it’s that I am undoubtedly a New Jersey girl. No, not the fist-fighting, tanning-booth-happy, thick-accented variety that The Jersey Shore and Real Housewives made famous (although I’ll admit that I did a pretty awful job with some Jergen’s self-tanning lotion the other day); but the pizza-snobbish, diner-frequenting, NOT-going-20-miles-per-hour-UNDER-the-speed-limit-because-what-the-hell-is-that-all-about?! sort. I don’t quite fit in down south, which is probably because my constant state of hurriedness and cynicism has embedded itself into the core of my being, as it does to any Northeasterner worth his salt. I will shout “long live the jug-handle” from the rooftops, and I’ve never pumped my own gas– I’m actually not sure I’d know how to go about it. However, there are a few things that have made me contemplate relocating in the past. They are, in no particular order: amazingly cheap housing, absolutely beautiful weather, and, of course, buttermilk biscuits. 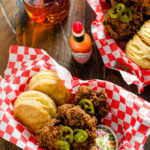 Yes, of all of the great foods south of the Mason-Dixon, buttermilk biscuits are the ones that truly have a hold on my (perhaps stereotypical) New Jersey heart. I long contemplated attempting to make my own southern-style buttermilk biscuits, but I felt that I lacked the qualifications. I mean what do I, a New Jerseyan, know about crumbly, fluffy buttermilk biscuits? The answer, as I quickly found, is nothing. I know nothing about them. If you are looking for those kinds of biscuits, the ones which crumble apart into gorgeous little pieces, all craggy-like with no distinctive layers… well, this is not the post for you. 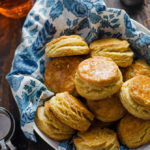 No, this is a post for those of you who see flaky, multi-layered, pastry-esque golden biscuits and think, “That’s exactly what I never knew I always wanted.” That’s what these Ultra Flaky Buttermilk Biscuits are, and this New Jersey native likes them even better than the southern kind. Gasp away. Exile me from your neck of the woods. What can I say? The heart wants what it wants. And I guess that I don’t have to move now. In order to make big, layered, flaky, freakin’ perfect biscuits, one must be willing to put a little effort in. That means that we need to roll and fold and work quickly to make sure that the butter doesn’t warm up as the biscuits are being formed. We need a food processor. We need a rolling pin. We need a biscuit cutter, or at the very least a cookie cutter, a glass, or I suppose even a knife if you don’t mind square biscuits. 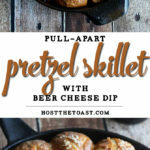 The point is, they aren’t the throw-together sort of biscuits that give you that crumbly texture. They take a bit of preparation. 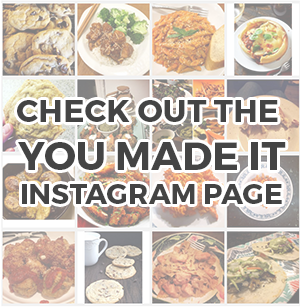 That being said, they’re relatively easy if you’ve got all of your tools, and they also can be made in advance and frozen to heat up with dinner (or breakfast, or lunch) any damn time you please. The cooked-from frozen biscuits taste just as delicious as the never-frozen ones, which I was truly shocked about. I now have 46 Ultra Flaky Buttermilk Biscuits in my freezer. That’s how much I love these things. 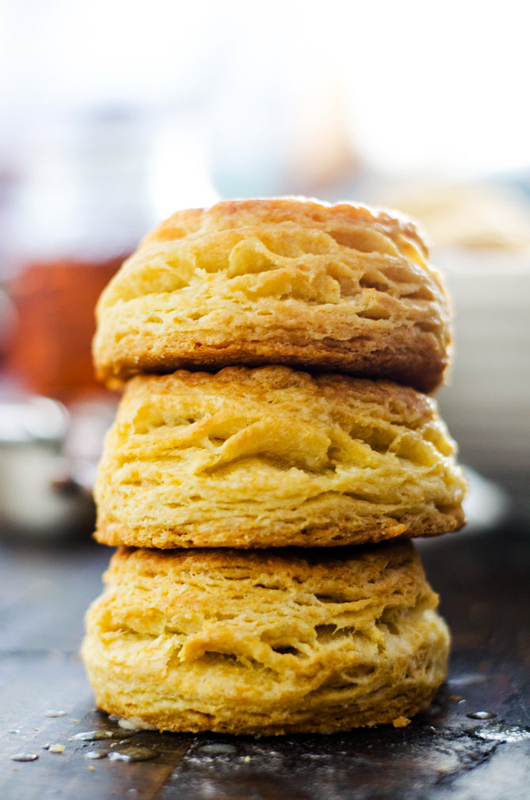 Butter, and how you use it, is truly the key to perfect biscuits. 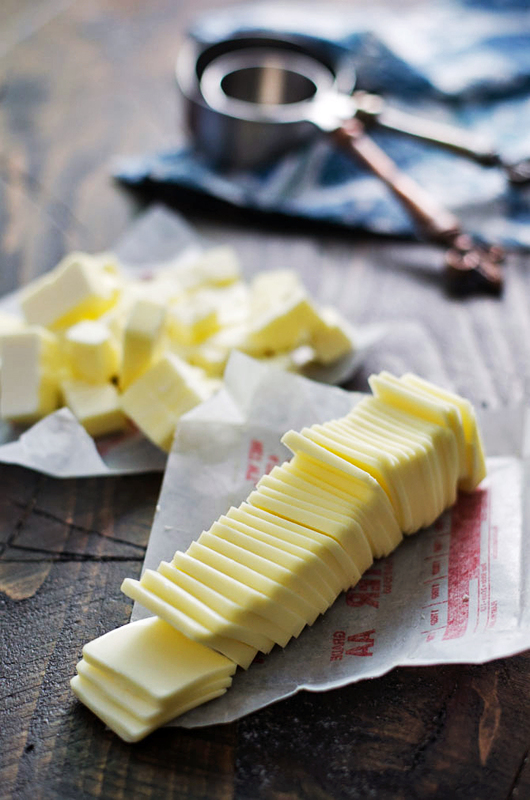 You want your butter to be as cold as possible, like freeze it until it’s almost hard to cut cold, because cold butter (when placed into a hot oven) creates steam which gives your biscuits lift and flakiness. If your butter is too warm, it will will melt and form a homogeneous dough, which makes for dense biscuits. Nobody likes dense biscuits. But that’s not the only note about butter. When you cut it, cut one stick into thin slices and the other into small cubes. The cubes will help create a softer dough, and the slices will help the dough become flakier when worked into the flour mixture. 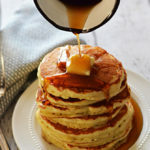 You can cut your butter into the flour mixture or work it in with your fingers, but I definitely prefer to use my food processor, as I mentioned above. 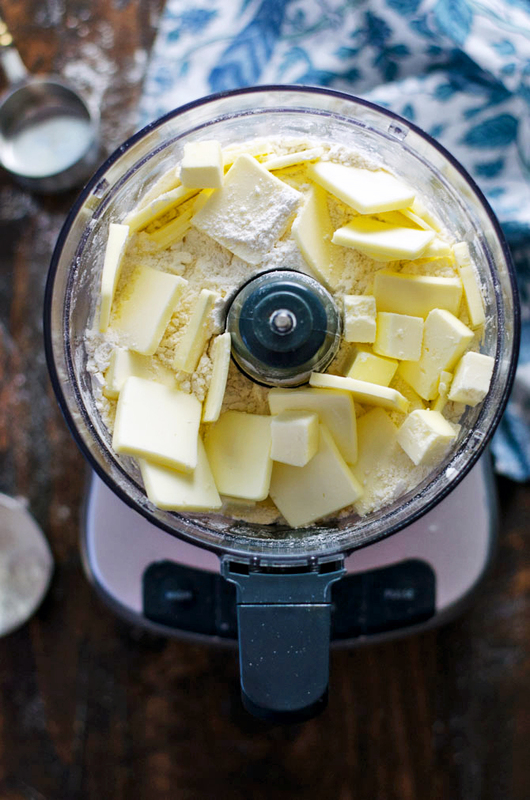 The food processor helps to ensure that the dough is evenly mixed and it doesn’t have to be handled for extra time (which would soften the butter). After the mixture resembles coarse crumbs, I mix in the buttermilk and egg until the dough is shaggy. Then, I shape the dough into a rectangle and fold it into thirds, like you would a business letter. I then flatten it gently, rotate the dough a half-turn, and repeat twice. This is what creates the biscuit layers. You have to be careful not to press too hard or handle it too much though, as that will make the biscuits tough. Gentle hands are a must. Then I just roll it (yes, gently) once more and cut out the biscuits. I brush them with a bit of egg wash and into the oven they go to get puffy and golden and, most importantly, FLAKY. Oh so flaky. 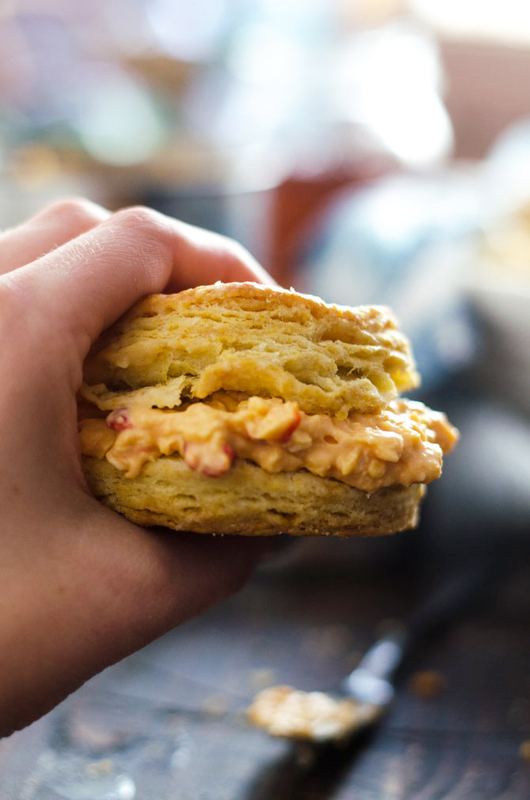 Just look at that gorgeous biscuit, loaded up with the (very addictive) 15 Minute Pimento Beer Cheese that I keep slathering everything with. If you think it looks delicious, well, it tastes about 50 times better. How’s that for a Jersey girl’s attempt at southern food, eh? 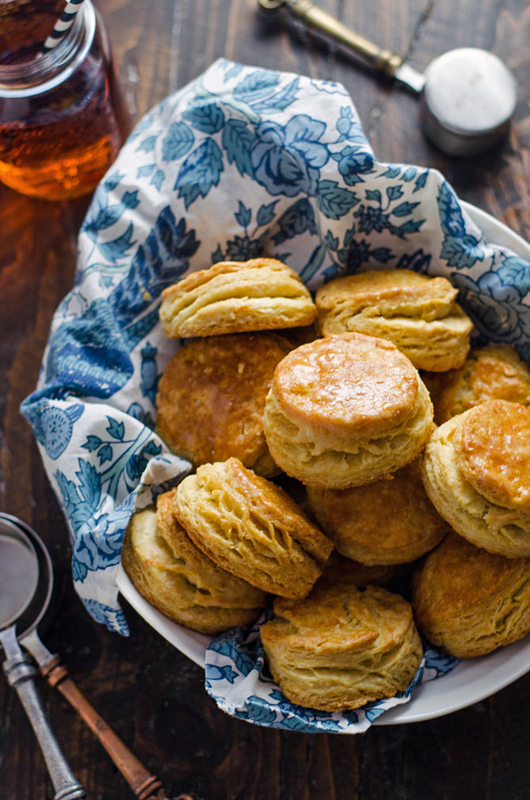 Try these Ultra Flaky Buttermilk Biscuits for yourself and see why I’m so obsessed. Oh and while you’re at it, pleaaaase don’t forget to take a picture and tag it with #hostthetoast on Instagram or Twitter! Show those flaky layers off to the world! 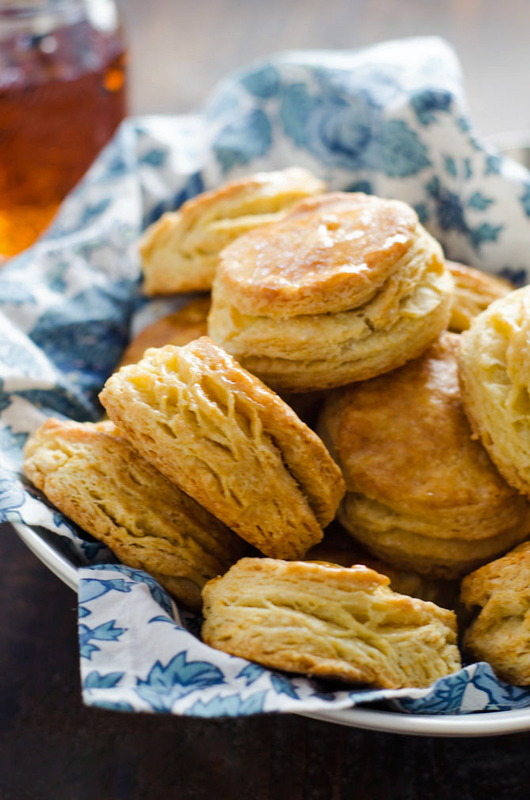 You can prepare these biscuits ahead of time to eat later! 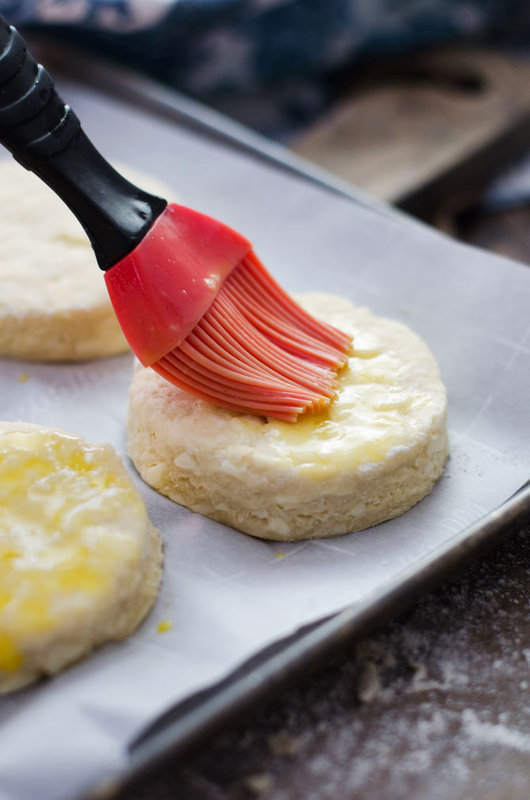 Place uncooked biscuits (not yet brushed with egg wash) on a baking sheet and freeze until solid. Then transfer to a sealable plastic bag. 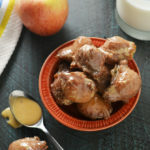 Freeze until ready to use– they don’t need to be thawed out. Simply brush the frozen biscuits with egg wash as you would fresh ones, and bake. You will likely have to bake for about 3-5 more minutes, but they’ll come out just as wonderfully as they do without ever being frozen. What a lovely recipe! Thank you so much for sharing. my whole family big fan of buttermilk biscuits specially kids.